I am SSG Richard W. Watson. I joined the Army in 1997 to bring some direction and focus into my life. I wanted to serve my country. I never worried about war or what I would do if faced with death in the service of my country. I was wounded in an IED blast in October 2004 during my first tour in Iraq and never had any regrets. 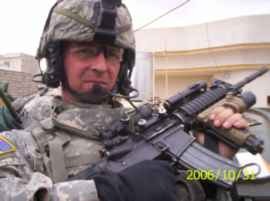 I began my second tour in the summer of 2006 as an infantry squad leader. To me this was the greatest achievement of my career and the greatest job I could ever hope for. I led a nine man squad on countless missions and was blessed by having some of the finest fighting men I have ever worked with by my side, without whom I would not be alive today to tell my story. I was wounded again in an IED blast in October 2006, and then again by a grenade blast in March 2007, which to my dismay brought me home and left my squad to carry on without me. I have no regrets other than I miss leading my men, and being the family man that I used to be. On March 27, 2007 while on a patrol we were watching for insurgents and suddenly there was a huge explosion off the side of the vehicle. We dismounted and began treating the casualty and we waited for a stretcher. I had put my guys along a wall watching the east across the street, covering those of us working on the injured man. As I walked over to report the actions to the LT, an explosion rocked my world and I opened my eyes only to realize I was facedown on the pavement. I don’t remember much after that but my platoon sergeant told me that I ran in under fire and picked up one of our guys who was bleeding and out cold, grabbed his drag handle not realizing that rounds were still exploding all around me. I heard nothing, felt nothing. Suddenly someone was there helping me carry the wounded soldier out of the alley. I rushed him to the vehicle and got him inside. I stood up in my hatch, and felt my knees buckle, I braced myself on the hatch, then everything went cross-eyed, and I couldn’t stand up anymore and just slumped down into the seat. When we arrived on base I heard yelling and the blast of the air horns, as the ramp came down I took a step off the ramp but couldn’t find my balance, I took a knee, and then went all blurry. I remember being covered in blood but to the shock of the doctors and my own none of it was mine. I spent two days there with a major concussion. I also received a double hernia in the course of the event. The headaches never went away, the memory loss is a pain, but I kept telling myself “I am alive”. After six weeks of light duty working only in an office because I could not handle my normal job, in mid May they decided to send me to Balad for a CAT scan. The doctors there felt that since this was my ninth concussion and that I my symptoms were still persistent that I needed to be sent home. I was flown out that night to Landsthul to be seen by the neurology department there. From there I was then sent to Brooks Army Medical Center for treatment for a traumatic brain injury, before sending me back home to Fort Lewis. My wife Tonya had to stop working to take care of me. I can no longer drive, stand up for too long, or do most of the things I used to enjoy. I still suffer from vertigo, blackouts, flash backs, nightmares and seizures. I have to wear glasses now because the Traumatic Brain Injury (TBI) affects my vision, causing a loss of my peripheral which the doctors are unsure of its return. I still suffer from short term memory loss so Tonya must give me my medications and assist me in the normal daily living. She has been by my side through my treatments and if not for her I do not know how I could survive. I do not regret anything that has happened to me nor do I have anger over it. The only thing I wish is that I could be the man I use to be for my wife and for my three children. I’ve proudly served my country, fought hard and long, countless days and nights doing what I came to love. The memories of those who did not make it home will forever be a part of me. God bless those men and women still in harms way and the families who stand behind them. I pray they all come home soon. And may God bless all of you who have taken the time to read my story. Be sure to note Richard Watson on the check. To be sure Richard gets your donation, please add his name to the recipient field.